With the spring thunderstorms in full swing in southwest Virginia, the mugginess has upped its game. I'm a firm believer is open windows until the heat is just unbearable. Ridiculous perhaps, but there's nothing like letting the outdoors inside, with the exception of bugs. Tuesday night I was more than warm, feeling the stickiness coming on, and in need (okay in want) of a crunchy, icy, very cold, drink. Oddly enough I was craving hot chocolate, but that's not such a good pair with the warm, humid weather. Then the idea struck me to make it frozen. Husband agreed to my challenge and we created our version of frozen cocoa. I was pleasantly surprised at how it turned out and I'm thinking it may be a frequent beverage in our home over these coming summer months. It's as simple as it sounds; make the cocoa just like you would on a winter night. For a quicker method, heat the milk in the microwave in a bowl. Stir in the cocoa powder and mix well. Cover and put in the fridge until it has completely cooled. 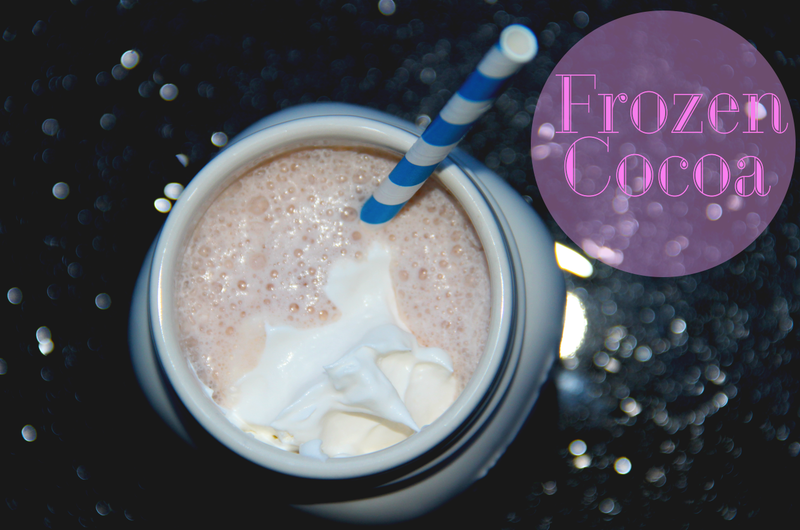 Put the cooled cocoa in a blender with the cool whip and the ice. If you're feeling fancy and have the time, make cocoa ice ahead of time to use in place of regular ice. Just make the normal cocoa and put it in ice trays the night before or several hours ahead of time. Blend until the desired texture is reached. For me that's a crunchy goodness. Top with cool whip and place a straw in your drink. Enjoy your refreshing cool down!